When it comes to our hair, bigger is always better. Feed your hair for gloriously thick and full strands from root to tip with our Hair Density Shampoo Intense. Put some life back into those locks with our ultra-concentrated formula infused with Amino Acids, Biotin and B-vitamins to visibly increase hair density, while each follicle is stimulated with our inclusion of caffeine to wake up the roots. Hair Density Shampoo Intense is like a workout for your hair – treat massaging and lathering the product into your hair like an exercise for stronger, more resilient hair with repaired fibres and a thicker, fuller head of hair. 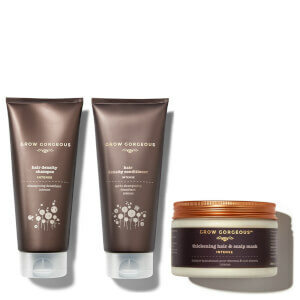 Follow with Grow Gorgeous Hyaluronic Density Conditioner for best results. Works best for fine hair. Suitable for coloured or natural hair.